I haven't drawn anything in a few days, so I thought I'd scan and upload something. I got this in my head a couple of days ago. Friday night, really, but I had something else I wanted to work on, so I put it on the back burner. It's Tinette, obviously, and her not very amazing ex boyfriend, Lucas. He apparently caught up with her. Unwilling to get shot, she took the initiative, and beats his face in with a broken broom. Possibly. Or she gets shot. WHO KNOWS?! Tinette's got her own collection of battle scars; flintlock rifles (Ha, you can't even tell he's holding one) leave a nasty mark, if you can survive in the first place. Tinette's nothing if she isn't stubborn. And vain. And angry. I blame Lucas for turning her into the people hating machine she is. 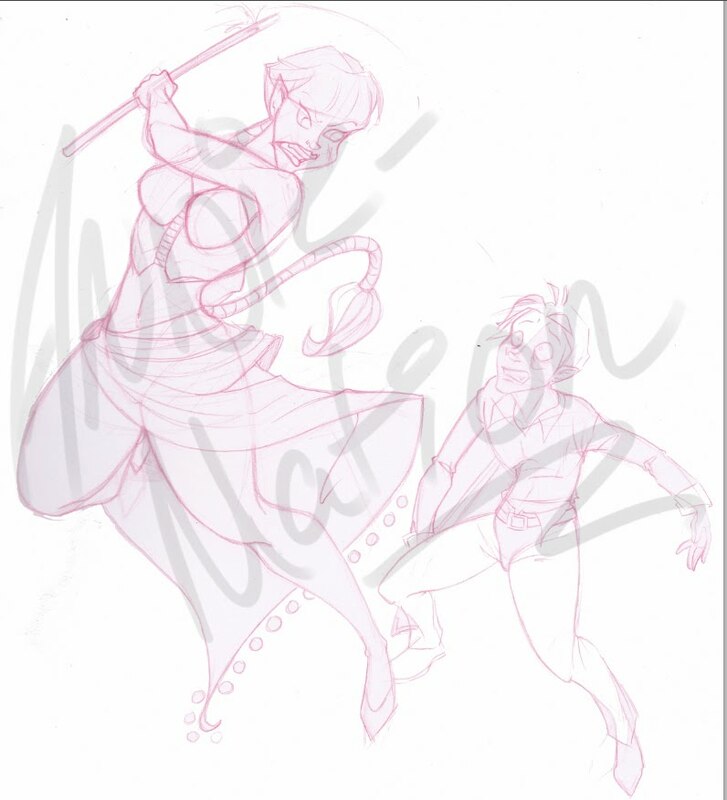 Woo, this sketch took me all bloody day, because I wouldn't sit down and actually work on it and kept adding a line every ten minutes or so while I was listening to music, watching Star Trek or RPin'. I wanted to draw something EPIC like. Nice poses. And his face lawl.